Tamoxifen Citrate is a potent and selective inhibitor of PKC (protein kinase C). It is known that Tamoxifen Citrate functions in PKC ε translocation. Studies suggest that Tamoxifen Citrate functions as an estrogen receptor antagonist in breast tissue. Once bound to the estrogen receptor Tamoxifen Citrate will not allow any other ligand to bind to the receptor. In contrast, Tamoxifen Citrate is an agonist towards this receptor in tissues of the endometrium. Studies indicate Tamoxifen Citrate inhibits DNA synthesis and transcription by recruiting co-repressors, which stop estrogen from interacting with genes. When combined with PAX2, Tamoxifen Citrate can inhibit the proliferation of ERBB2. It is also a high affinity activator of the GPR30 receptor. 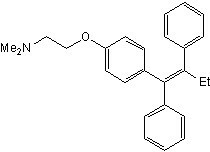 Tamoxifen Citrate is an activator of Estrogen Receptor.